Over 80 million people live in Germany and German is also an official language in Austria and parts of Switzerland, Belgium, Luxembourg and Liechtenstein, making it a popular choice for European companies to expand into. If you're looking to create a website, or complete an SEO (Search Engine Optimization) or content marketing campaign for a German audience, then there are certain language differences that affect your options and it’s important to choose the right approach for your campaign to be effective. As Mark Twain wrote in his Notebooks & Journals, "The German language is a dozen fragments of words flung into an octagonal cylinder - take a good look at them before you begin to turn the machine, for you will never see them in their simplicity again … Turn! - up spring your fragmental elements with Ver's & Be's & Ge's & Er's & lein's & chen's & ung's & heit's & keit's & zu's and a thousand other flashing and blazing prefixes, affixes and interjections broidered on them or hung to them. - Turn and turn! The combinations will be infinite, bewilderingly enchanting and magnificent." When translating text on images, this tendency to create compound words is a particular challenge. In English for example “Search Engine Optimization” could be written with one word above the other on 3 lines, but in German it’s “Suchmaschinenoptimierung”, which means it’s best placed on a single line. If you’re still at the design stage of your project, it’s therefore worth considering either not having text on images, or ensuring that all your images are sufficiently wide to accommodate these lengthy words. If you’re writing PPC adverts with components of limited length, or even Title Metatags which are recommended to be a maximum of approx. 55 characters, then it’s important to think carefully about which words are vital to include here and a direct translation of these elements from English won’t always be possible. In terms of the visible content, we recommend not using too large a font size for your H1 titles and keeping them to as few words as possible and using H2 or H3 sub-headings to communicate extra information. On a multilingual site, you might even consider using CSS to make the font size smaller just for the German titles! When doing on-page SEO in English, we often look at short 2 or 3 word phrases, as well as single words, for example if we optimized a page for “Kitchen tiles” we’d include “Kitchen” and “Tile” separately on the page too, and not always put “Kitchen tiles” together as a phrase. In German “Küchenfliesen” (kitchen tiles) is a single word, however it’s just as important to use “Küchen” and “fliese” as separate entities, as Google (which 92.5% of people in Germany use as their preferred search engine) is able to take this kind of thing into account. When doing keyword research you may find that German speakers also use anglicized versions of words and it’s therefore important to do thorough keyword research. If you use Google’s Keyword Suggest tool, then you get more accurate results if you select ‘Germany’ and ‘Austria’ as locations than if you just select ‘German’ as the language. Between Austria and Germany the spoken language is very similar, however the written language contains some significant differences, in particular in the fields of law and economy, mainly because Austria was excluded from the development of the German nation-state in the late C19th. Culinary terms also vary significantly, so if you’re completing a German SEO or marketing project in one of these areas, it’s important to pay particular attention to the language differences. When the Englishman Tim Berners-Lee invented the worldwide web and html, he didn’t include accented letters, because English doesn’t have any. In order to enter accented letters in html code, it’s therefore necessary to use a string of characters. The same applies for web addresses (URLs, using something called UTF-8) and similarly if you have a QWERTY keyboard, to add foreign characters you have to either copy them or press ALT and a combination of numbers, as shown in the table below in order to add them. (We’ve also included the Euro symbol, as this similarly doesn’t exist in html). Many people searching the net will omit accents from their search terms and it used to be recommended practice to include some words with accents and some words without accents, in order to appear high for both. Google is now sufficiently advanced that we recommend using the correct spelling 100% of the time and if a word has accents, always include them. The only exception to this is in the URL (web address), as accents in URLs don’t always display properly in browsers and if copied into a Word document or email will become a string of % signs, letters and numbers (as shown in the table above), which looks messy. If you’re using a CMS to create your website, search for something called ‘transliteration’. All the major CMS systems provide the option to transliterate accented characters to normal letters. Like several other European languages, including French and Spanish, but unlike English, German has two words for "you", "du" is the informal and "Sie", the formal version. If you're appealing to the teenage market then using "du" may create more of a rapport, however if you're launching a business to business website, then using "Sie" would be more appropriate. If in doubt, use "Sie", as this is the politest form and therefore will never offend. Depending on the context, you might also need to use the following words for you - "man", "ihr", "dich", "dir", "euch", "ihnen" and "eine", but that would be a grammar lesson, rather than a marketing tutorial. 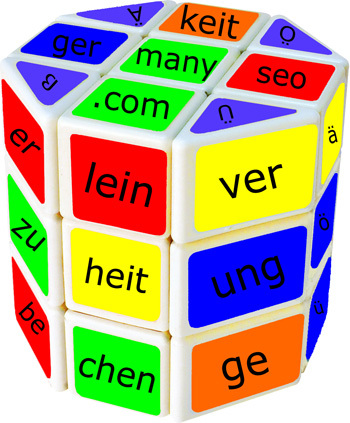 Having a German sounding domain name helps visitors recognize that your site is in that language and, from an SEO perspective including local keywords in your domain name helps you appear higher for those keywords (although many companies feel branding is more important than having a keyword rich domain and indeed, only 3 of the top 100 most visited domains internationally actually contain a keyword). 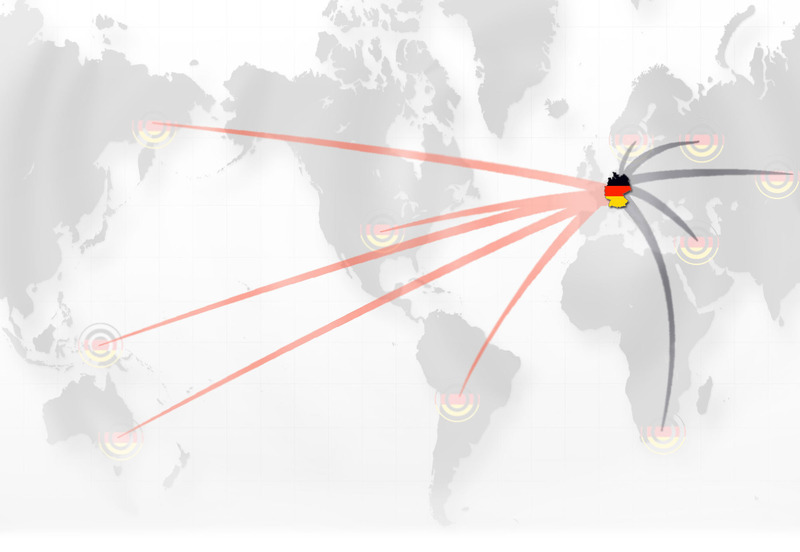 If you have an international domain like .com or .net, but are only looking to attract customers in one country, then you can tell Google which your target country is using something called geotargeting. Where possible we also recommend including a physical address in Germany on your website (probably in the footer on every page), as well as a local phone number. Google also look at the links going to your website, so having links in the same language and preferably from the same country is essential for your link building strategy. Completing effective online marketing work in Germany or Austria requires that you take the language differences into account, in particular the regular use of compound words and the use of accents. For SEO campaigns, keyword research should take account of both compound and non-compound words and anglicized words which are in common use. This article has focused very much on SEO and the German language, however having an understanding of the different culture is another important factor, but beyond the scope of this article. If you would like help with optimizing your website or with content marketing, then please contact us for more information.